Knife gift sets are thoughtful and useful housewarming gifts for the new homeowners. 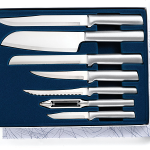 In fact, this made in USA knife gift set would make great gifts for anyone who cooks. Rada cutlery knives are hand sharpened to get a razor sharpness edge. Their knives come with surgical-quality, high-carbon stainless steel blades. Their knife gift sets come in nice boxes with a form-fitted thermal to keep them in place. Rada knives are great useful kitchen tools and they last a lifetime. This housewarming knife gift set by Rada Cutlery is made in USA and comes with lifetime guarantee. There are 3 different types of knives in this package. You get a regular paring knife, a utility/steak knife and a slicer. The regular paring knife is 6.75″ long with the blade being 3.25″ long. The utility/steak is 8 5/8″ long and the blade is 4 7/8″ in length. The slicer has a length of 11 3/8″ with a 7″ blade. The regular paring is great for cutting vegetables and fruits. 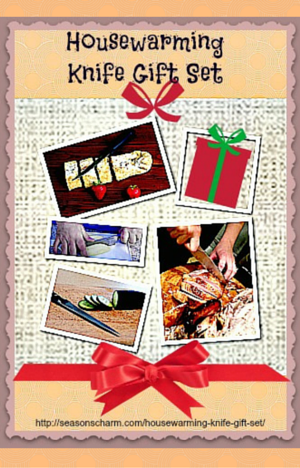 The slicer does a good job slicing your turkey or any meat stuff. It is also great for cutting bigger size vegetables such as the melon. The steak knife comes with a non-serrated blade for a smooth cut, a great tool for cutting your juicy steak or tasty pork chop. You can either get the set with the black stainless steel resin handle or the same set but with silver brushed aluminum handle. The knife set that comes with silver brushed aluminum handle are meant to be hand wash only. The other set with the black handles can be washed in the dishwasher. These knives are durable, lightweight and have sharp blades. This knife gift set looks lovely, functional and affordable. The knives in this set are really useful. If you add in the Rada knife sharpener with this gift set, then that would be wonderful. The 3.5″ long and 2″ tall sharpener is also made in USA and comes with lifetime guarantee just like the knives. 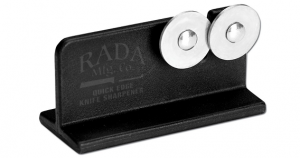 The knives will always be sharp as they can be easily sharpen using the Rada knife sharpener. The Rada knives are good quality kitchen knives. The recipient will be thrilled to receive this beautiful housewarming knife gift set. This starter knife package consists of a regular paring, vegetable peeler, tomato slicer, super parer, 6″ bread knife, cook’s knife and a slicer. The knives come with silver brushed aluminum handles and are made in USA. The brushed aluminum handles allow for a good grip and the blades are really sharp. You can also get this same set with black stainless steel resin handles. As with all Rada knives, these come with lifetime guarantee. The set with brushed aluminum handles should be hand washed only whereas the ones with the black stainless steel resin handles can be washed in the dishwasher if you wish to. This American made knife set includes the Quick Edge Knife Sharpener, Heavy Duty Paring and the Super Parer. Super parer has a length of 8 3/8″ with a 4 3/8″ stainless steel blade. Heavy duty paring is slightly shorter at 7 1/8″ length and a 3 1/4″ length blade. The heavy duty parer is great when you want to cut, slice or core fruits or vegetables. The super parer is a large paring knife that is suitable for cutting larger cuts of meat and vegetables. This set comes with black stainless steel resin handles only. You can wash them in the dishwasher.